PULLMAN, Wash. – Helping patients better manage their own health is a crucial goal — both medically and economically — but achieving that goal will require health care technologies that are sensitive to patients' values, researchers at Washington State University are finding. Chronic diseases, such as diabetes, asthma and heart disease are on the rise worldwide. The Centers for Disease Control and Prevention reports that chronic diseases are the most widespread and costly health problems facing the United States. As a result, advancing patient-managed health with the use of technologies is a growing priority. While medical devices, Web solutions and mobile apps have empowered patients to manage their conditions, little is known about how their personal values are supported or constrained by these technologies. "Chronic disease patients are in high need of technology systems that will more effectively help them deal with intrusive health problems," said researcher Majid Dadgar, a recent WSU graduate and assistant professor at the University of San Francisco School of Management. With computing prices going down, health care technology is more available than ever to chronic disease patients, and it presents an opportunity where "we can make a positive impact in their management processes without interfering in their lives," said Dadgar. "It's not just about making a profit." To inform the design of self-management technologies, Dadgar and coauthor K.D. Joshi, WSU Carson College of Business professor, analyzed data collected from people using "Glucose Buddy," a free mobile app commonly used by diabetes patients. Participants used the app on their own for a week while keeping diaries on its performance, then reported their experiences. 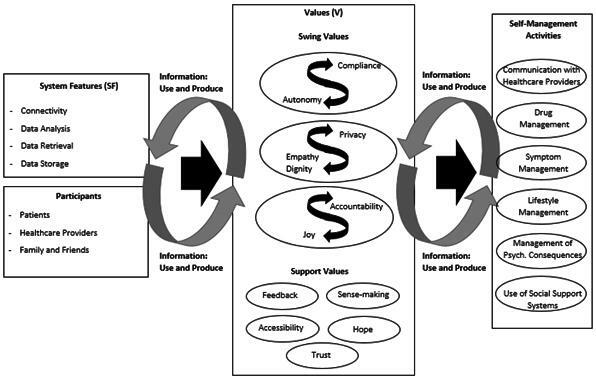 The study showed that 12 values are specifically important to diabetes patients: accessibility, accountability, autonomy, compliance, dignity, empathy, feedback, hope, joy, privacy, sense-making and trust. For example, patients' autonomy may be enhanced through a phone-based diary that enables them to input additional information while self-managing their glucose levels. It also empowers them to customize their routines. Additionally, patients with access to Web-based resources or mobile phone technology that connects them immediately to nurses, are more hopeful and confident about managing their chronic conditions. Patients indicated that data connectivity, data analysis, data retrieval and data storage are critically important to self-management system features. These features provide patients with real-time communication with health care providers and health coaches and improve interpretation and storage of their personal health data, such as activity level, burned calories and potential impact on blood glucose levels. A comprehensive and automated food database, for example, could display calories and carbs, making it easier for patients to choose healthful foods. The researchers suggest the values revealed in the study may be used to guide the design of value sensitive self-management technologies and encourage the use of them to drive certain health care outcomes. For instance, portion control is intertwined with the value of joy (i.e., patients eating food they enjoy). This insight could push health care providers to recommend using technologies to balance the ill effects of certain foods with the benefits of enjoying life as patients learn to live with their chronic condition. Additionally, examining the impact on patient outcomes could help health care providers harmonize priorities in order to manage symptoms in accordance with patients' concerns for their values. The patients' family members or friends. Adapting to a new life style, processes and activities. Managing medications, products and services. Interpreting information about the disease. "Ideally, any suggested self-management system should consider the all these components and, most importantly, be attentive to patients' values," Dadgar said.